Printmaking studio, gallery and shop providing open access to printmaking facilities, commission print making and digital printing. Edinburgh Printmakers provide print making skills and facilities, including lithography space and presses, screen printing tables, relief press, etching space with presets and chemicals and digital printing facility. Typical clients are independent artists, art galleries and commercial clients. Previous knowledge of printmaking required in order to access the studios, however they provide regular classes and workshops. For digital printing no previous knowledge required. Colour images should be in RGB. Save a scaled and flattened version of the file as Tiff or Psd file. Images for acetate should be scaled, bitmapped and saved as Tiff or Psd bitmap files. 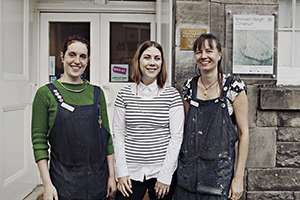 Edinburgh Printmakers’ mission is to support artistic excellence in the medium of print through inspiration, education, innovation and facilitation. The studio works at the cutting edge of contemporary visual art, producing critically acclaimed and engaging artwork that is key to the cultural life of Scotland.